Find out about these and other Lord of the Rings filming locations. Recognition of the outstanding natural values of the area was granted by UNESCO in December 1990, with the formation of the Southwest New Zealand World Heritage Area, also known to Ngāi Tahu as Te Wāhipounamu (the place of greenstone). This area incorporates Aoraki/ Mt Cook, Westland/ Tai Poutini, Fiordland and Mt Aspiring National Parks, and covers 2.6 million hectares or 10% of New Zealand’s land area. World heritage is a global concept that identifies natural and cultural sites of world significance – places so special that protecting them is of concern to all people. Human activity has been limited in Fiordland but there were always some who were willing to endure adversity in the search for new places or resources. European settlement was hampered by the steepness of the terrain, isolation and the wettest climate in New Zealand. Early Māori people hunted birds here and caught fish from the sea and gathered pounamu (New Zealand jade) from the rivers. Later, sealers and whalers took shelter in the fiords and built small settlements in a number of locations. The variety of habitats in Fiordland allow a diverse flora and fauna to thrive and its isolation has encouraged endemism with over 700 plants found only in Fiordland and it is, or was, home to some of the strangest of New Zealand’s birds. The takahē, for example, is a large flightless rail related to the more populous pūkeko, more commonly known throughout Australasia as the purple moorhen. It is of ancient lineage and poorly adapted to cope with introduced predators. The takahē was thought to be extinct until it was rediscovered in 1948. Fiordland was also the final refuge of the worlds only flightless parrot, the nocturnal kākāpo. A recovery project for these unique birds is now under way on a number of pest free offshore islands. The rare mohua or yellowhead is also resident in some Fiordland valleys. Insect life abounds but is secretive in general. The exception of course is the notorious namu or sandfly and insect repellent is essential for visitor comfort. 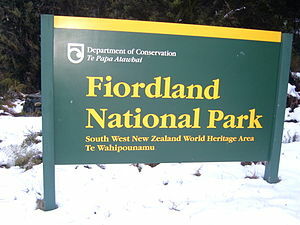 In the 1960s and 70s Fiordland was the scene of one of New Zealand’s most important conservation battles. The hydro-electricity industry was, in the end, prevented from raising the level of Lake Manapōuri and it remains one of the park’s scenic highlights.